Traditional Tantra offers time-tested, psychologically sophisticated methods for developing deeper self awareness to attain personal fulfillment, spiritual liberation, and enlightenment. Ask about any Ashram West groups that may be available. Brother William offers private classes on his books, Gay Tantra, Gay Tantra in Action, and Secrets of Gay Tantra. There is no public class meeting at present. There is no charge for classes. Donations are gratefully accepted and help support our work. William Schindler, a.k.a., Brother William or Swami Mahavirananda, founder and Spiritual Director of Ashram West, obtained a B.A. in Sanskrit from UC Berkeley (1975), where he also studied Hindi and Bengali, and a Master's degree in clinical psychology from Antioch University (1986). He has been studying and practicing traditional Hindu Tantra since 1969. He lived in India for two-and-a-half years between 1972 and 1977 first as a pilgrim, then as a student at Banaras Hindu University, and finally as a monk of the Ramakrishna Order. He worked as a psychotherapist in a variety of settings and founded and coordinated a counseling program for at-risk youth at the public high school where he also taught English for ten years. 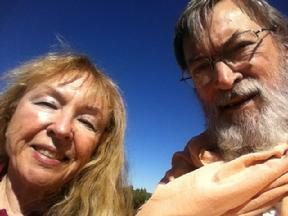 He corresponds with students all over the world, and he welcomes inquiries regarding spiritual practice and Ashram West. Click here. to contact Brother William by e-mail. On 6 October 2013 Brother William received the vow of sannyasa from Pravrajika Vajraprana and became Swami Mahavirananda. Vajraprana received sannyasa from Swami Amohananda, a monk of the Ramakrishna Order. Vajraprana, a.k.a., Vijali Hamilton, first joined the Ramakrishna Order as a nun in 1953. She lived at the Santa Barbara Convent of the Vedanta Society of Southern California for ten years. She now lives in Santa Fe, New Mexico, where she heads The World Wheel Project that utilizes art to foster international understanding and peace.